If you've ever played the computer game The Sims, you know that the game's titular characters are affected positively or negatively by their surroundings; they have a "room" score. The nicer the room, the happier your Sims will be. This is what my Baywood Park apartment looked like when Sylvia and I started dating. 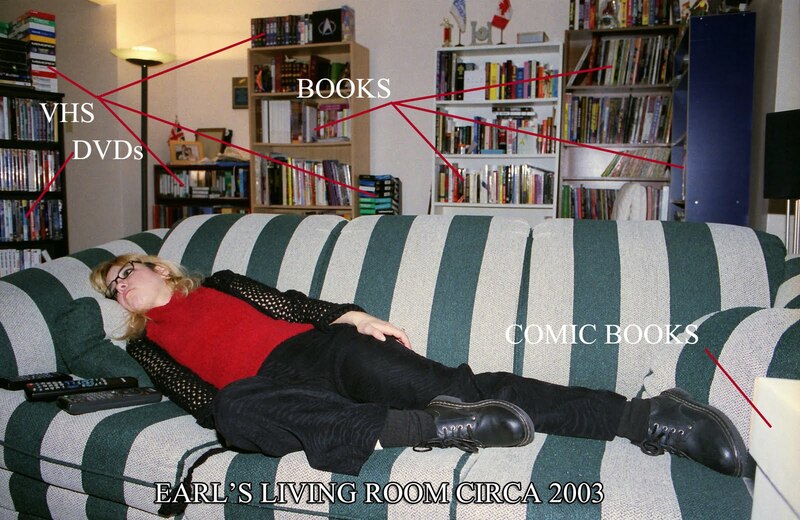 As you can see, Sylvia is mashed into a tiny space on the couch, surrounded by towers of clutter. I still feel that any room is nicer with bookshelves, but Sylvia has very different aesthetic priorities. Her "room" score always took a dive whenever she visited my place, and with good reason; every room of my two-bedroom abode was filled with similar piles of stuff, save the bathroom. When we moved into our first condo, it took several weeks to sort out all of my stuff and bring some semblance of order back into our lives. During this time, Sylvia would often pace up and down the halls of our new home, her eyeballs rolling around madly in their sockets. Sylvia is orderly. So am I, but only when it comes to my books and movies; those are all carefully arranged by alphabetical order or genre. Unfortunately for Sylvia, this touch of OCD is limited to media; it does not extend to arranging furniture, sorting laundry, fixing appliances and so on. This is almost certainly because I feel that the books I read and the movies I watch reflect my identity in some way. They're an expression of my outlook and style, though what message they send I'm not sure. I don't feel the same way about decor, though thanks to Sylvia I'm learning to appreciate that subtle art a little more. I actually had when Sylvia and I unpacked our artwork and hung various paintings and photographs around the house. It really does make a difference in the feel of our home. And even though I have a high tolerance for household clutter, I have to admit that from time to time I'll go on a cleaning binge to straighten out the mayhem of my office. I always feel better when I do, too. There's something quite satisfying about forging order from chaos every once in a while. Sylvia's helped me appreciate this aspect of life a little more, one of many reasons why I'm so grateful to have her in my life. From a messaging standpoint, I believe the proper term for 'disorder' is 'controlled chaos'. Alas, Earl, as another guy who has OCD about some things and disregard for others, I feel your pain! You know, you can always improve your room score when you buy more art. Buy more art. Buy. More. Art. If only I could pin down where I've heard that before. Interesting point about certain stuff being ordered because it's part of how you identify yourself and the rest being unimportant and therefore, unorganised. I feel the same way about a lot of the house too, but realise that even if I don't feel it's part of me, it certainly reflects on me to others. Does this really make me any tidier? No, not much, it just adds some anxiety when I finally notice the level of clutter or when someone is about to come over. And I agree, Sylvia has super powers.